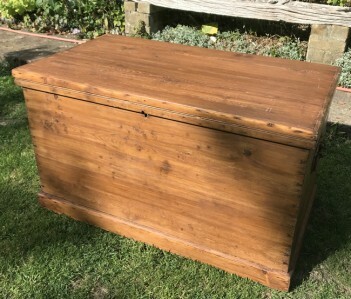 Really good example of an antique pine box or trunk. This one has handles on the sides and an internal candle box and internal drawer. Sorry, no keys. Please take a look at the last photo to see how this box looked before we waved our magic wands. We had this professionally stripped and then waited for it to dry out before sanding, polishing and waxing. This box is darker in colour that most, and is in excellent condition. No home should be without one of these as they are amazing storage, great for shoes, linen, toys, christmas decorations. They can also double up as side tables, coffee tables and additional seating with a cushion on top.